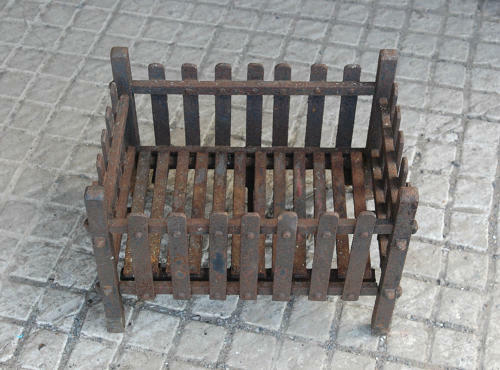 A reclaimed cast iron fire basket with traditional design. The basket has spaced bars forming the basket sides and a grill made of 2 sections. The basket is in rustic condition and does have surface rust. The basket is perfect for garden use, perhaps as a fire pit or could be used for flowers. The basket can be blacked and polished by us for an extra £40 if required. Please let us know at time of purchase if you require this service. The basket has signs of use and wear and it has a slight lean (please see pictures for details). A nice basket that is versatile and has simple stylistic character.